Mr. Bell has tried over 300 major cases throughout the United States and is reported to have one of the highest win/loss records in the country. 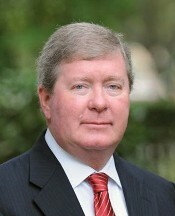 He holds the record for the largest medical malpractice verdict in Georgia and the largest products liability verdict in New York. Attorney J. Edward Bell III, senior partner and founder of Bell Legal Group in Georgetown, S.C., specializes in complex trial litigation. A graduate of University of South Carolina School of Law, Ed distinguished himself as a top civil litigator in the field of personal injury law with his success in the demanding auto torts and auto safety field. His unique approach in auto case work led him to establish a Vehicle Safety Research Center, a facility that conducts auto defect investigations, accident re-enactments, develops exhibits, and explores the complex nature of the issues surrounding injury and accident cases. The center works to assist the firm’s attorneys with unraveling technical information used to explain the events associated with auto accidents during trials. Ed’s legal career continues to bring him national recognition in the fields of Environmental Law, Auto Safety, Auto Defects, and Medical Malpractice. Ed’s work in Environmental law coupled with his love of Southern culture and heritage prompted him to explore opportunities for land development with an emphasis on environmental conservation. In 2010, he became a partner in Garden & Gun Magazine, a nationally recognized Southern lifestyle publication. That partnership, along with the acquisition of an established coastal real estate business, continues to help broaden his environmental pursuits on the national level. An AV rated attorney, Ed is listed in The American Trial Lawyers Association’s prestigious Top 100 Attorneys, Best Lawyers in America, Super Lawyers, Lawyer of the Year, Benchmark’s Litigation Star, and SC Lawyers Weekly Leadership in Law Award.